This post is going to be long, because I have a serious bone to pick with Disney. Specifically, the live-action remake of Beauty and the Beast. But I’ll put that rant at the end of the post. 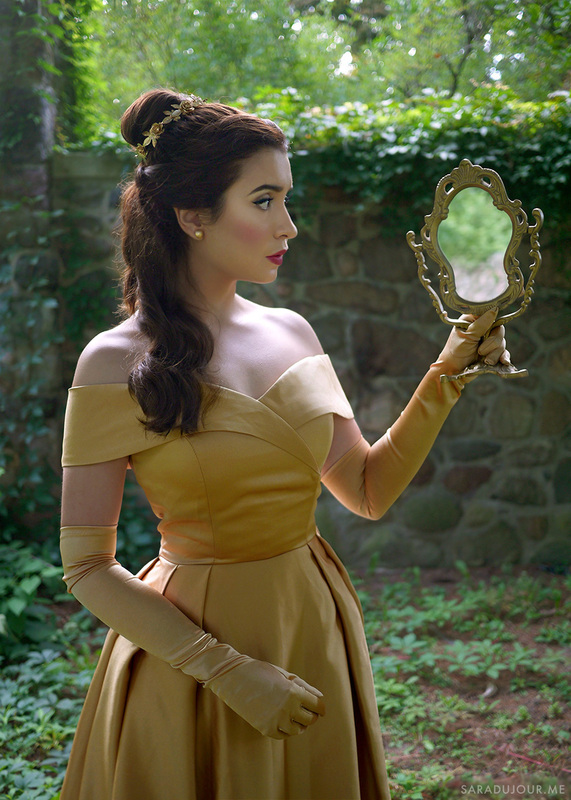 Let’s talk about this Belle gold dress costume first. Beauty and the Beast was released in 1991. Which happens to be the same year I was released (from the womb). Coincidence? I don’t think so. It’s by far my favourite Disney movie, and one of my favourite movies of all time. Calling it formative would be a huge understatement. 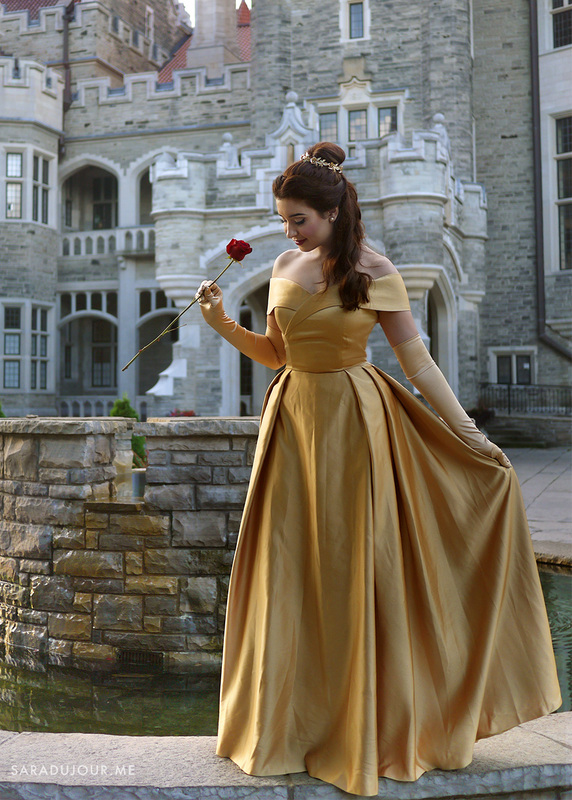 I imprinted on the character of Belle and her iconic gold gown like a newborn duckling does on its mother. Every time I buy an item of clothing that’s off the shoulder, on a subconscious level, it’s probably because of Belle. There are a number of dresses throughout movie history that became instantly iconic. Marilyn Monroe’s strapless pink gown from Gentlemen Prefer Blondes comes to mind, as does Julia Roberts’ red dress with white gloves from Pretty Woman. 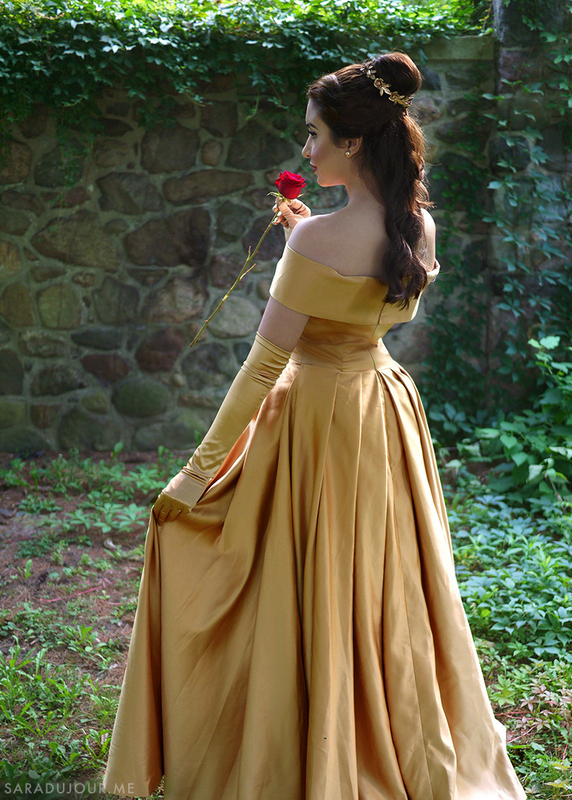 But possibly the most iconic movie dress of all time is Belle’s gold off-the-shoulder gown. I’m sure I wasn’t the only little kid who looked at that dress with wonder, hoping to one day wear something as spectacular. 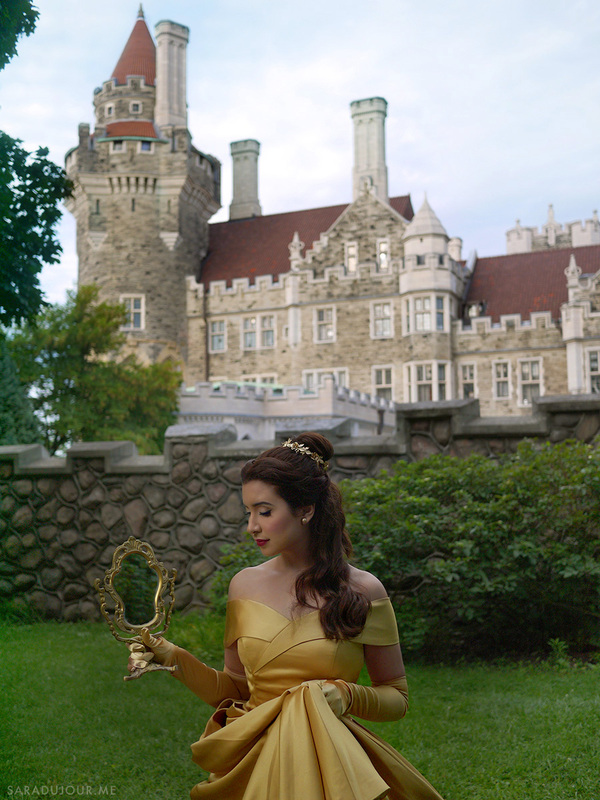 Over the years I’ve toyed with the idea of doing Belle’s gold dress costume, but I couldn’t figure out how to bring it to life in a way that was satisfactory to me. 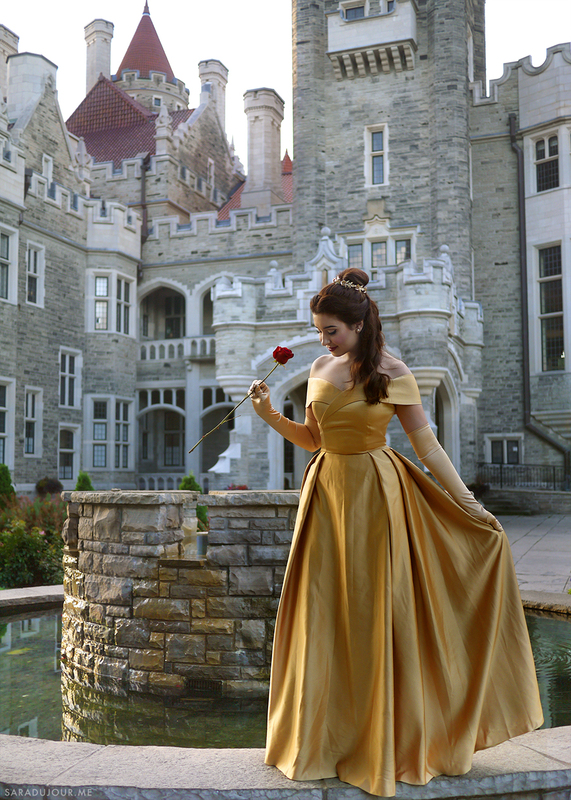 Every version of Belle’s gold dress I found online was either very costume-y and low quality-looking, or some kind of short, totally inaccurate version. 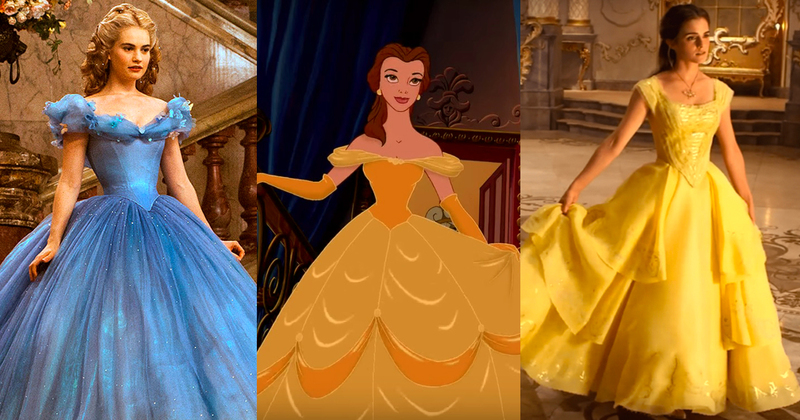 Here are a few references for Belle’s dress, hair, and makeup from the animated movie to use as a starting point. Per my usual MO, I like my Halloween costumes to look like what the character might have looked like in real life, instead of looking like an exaggerated costume. 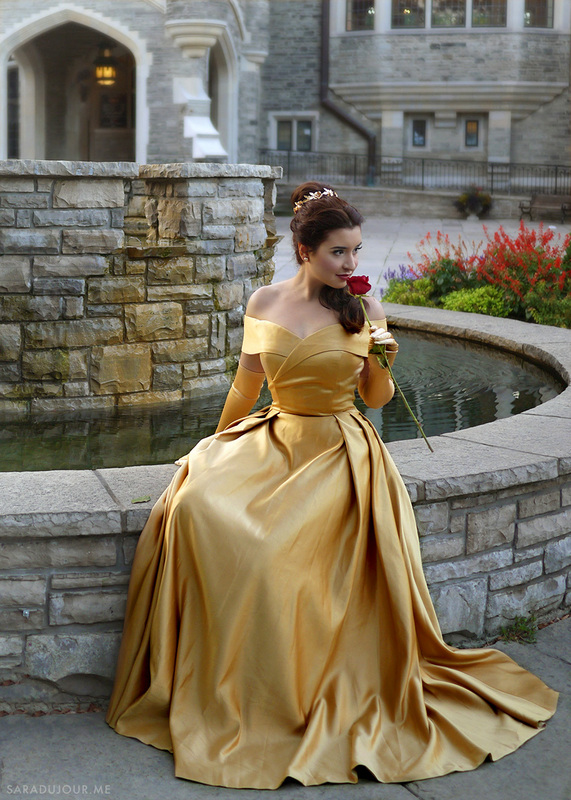 To that end, I wanted to find an actual gown worthy of Belle. I debated between a yellow gown and a gold gown for a while, until I decided for myself that the yellow animated dress would have been a gold dress in real life. So began the hunt for the perfect off-the-shoulder, A-line, gold Belle gown. I scoured every corner of the internet (as I always do when putting together costumes), debating between several options until I found this dress, originally in baby blue. 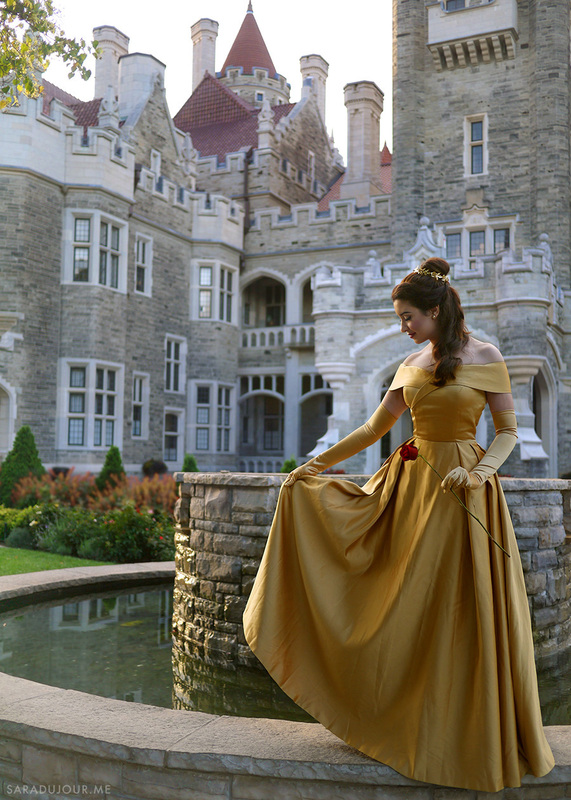 I had it custom made in gold, and removed the slit and the train to make it the Belle dress of my dreams. Next on the list was finding elbow-length gold gloves that matched. I actually got super lucky with that, finding this pair on Amazon that happened to be the perfect shade of gold! In the ballroom scene, Belle wears round, gold stud earrings, for which I easily found an affordable equivalent at Forever 21. The last thing on my list was the gold band she wears around the bun in her hair. Animated movies simplify everything (as they must), so when doing a real-life recreation, I wanted the gold band to be something more intricate. I ended up finding this gold rosette headband in my existing collection (also from Forever 21 a while ago, heeeyyyyy) and DIY-d it a bit to suit my purpose. I cut off the elastic it was attached to, and bent the metal portion into a smaller circle to fit around the bun’s shape. For props, I bought red roses, and happened to already own an ornate stand mirror which I bought years ago because on some level it reminded me of Beauty and the Beast. I told you I imprinted on this movie!!! 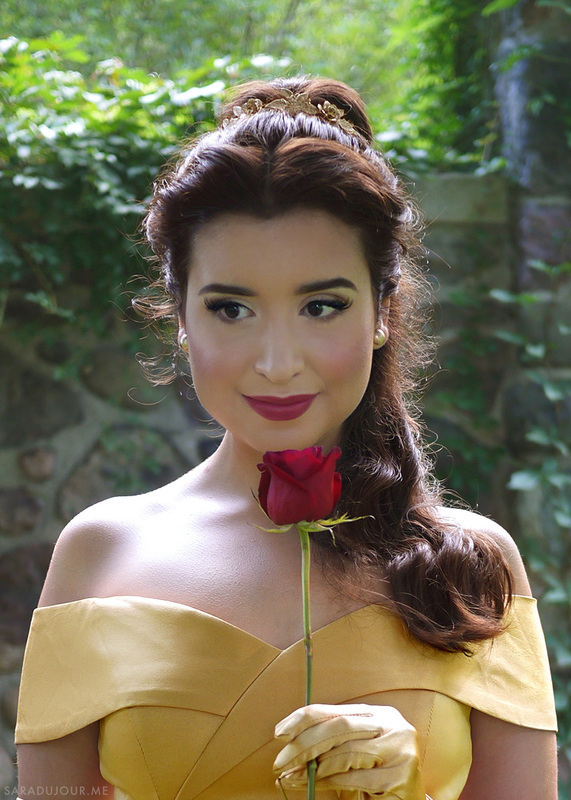 Belle’s whole gig is being a natural beauty, so IRL she’s probably not wearing any makeup. BUT I AM! And a lot of it. 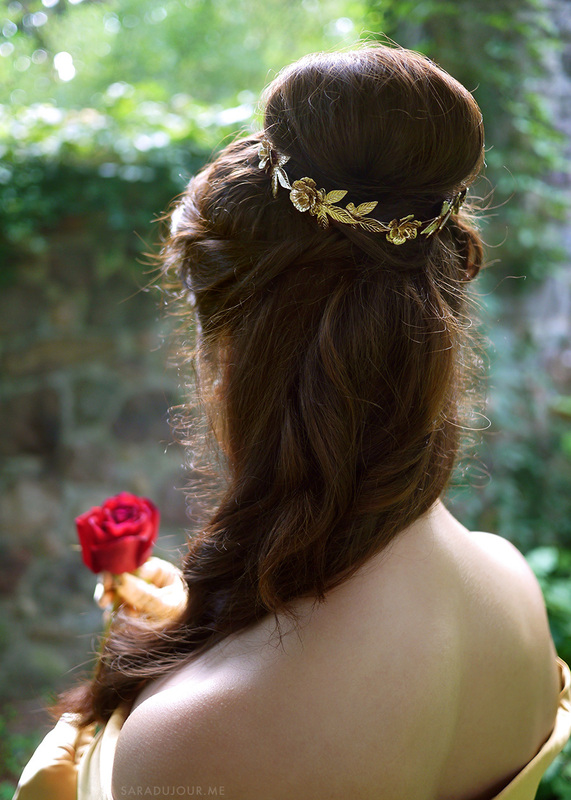 ;) I used a high-coverage foundation and heavy contouring to give myself that Disney-princess, flawless base. To mimic Belle’s big, upturned, animated eyes, I used liquid liner, angled upwards to alter my natural eye shape, and applied false lashes in the outer corners to further amplify this cartoon effect. Add a dark rose lip colour and some pink blush, and you’re officially the Belle of the ball! Figuring out how to recreate Belle’s formal hairstyle was a challenge, mostly because Belle’s hairstyles in this movie make no damn sense. The laws of physics don’t seem to apply to them. But after a few trial runs, a lot of hairspray, and a bit of trickery, I figured it out. There’s a huge velcro curler hidden in the bun of my hair to give it its shape! And a lot of cleverly positioned bobby pins throughout. For bonus points, I added a bit of dark brown eyeshadow to my hairline to create the illusion of a widow’s peak, since Belle has one and I do not. And now for The Rant™. Fasten your seatbelts folks, this is going to be a bumpy ride. I want to start by saying there are a lot of things about the live-action Beauty and the Beast movie I DID like. The supporting cast members were awesome (Emma Thompson, hell yes! ), the additions to the plot were a nice touch, and the sets were spectacular. My beef with this movie specifically centers around Belle’s villager dress and gold dress. In my opinion, a live-action version of an animated outfit should be much more elaborate, since it has the ability to be intricate and textured (which is difficult to animate). So Belle’s dress SHOULD HAVE BEEN the most breathtaking, iconic, dress-of-a-lifetime gown that ever graced the silver screen. I should have dropped dead from how stunning it was. The costume department had two main jobs, and a ton of Disney budget with which to accomplish them. 1) The dress needed to be gold. 2) The dress needed to be off-the-shoulder. Those are the two most iconic things an entire generation fell in love with, and THEY FAILED AT BOTH. Instead of a breathtaking, scene-stealing dress, we got this….cheap looking, plain, stark yellow prom dress. Honestly, I’ve been enraged since the promotional photos were first released until this very day. Doing this costume myself was a way for me to cleanse myself of my rage and put my soul to rest. Operating on my own budget, without a huge corporation behind me, I was able to afford some damn elbow gloves and a formal-looking gold gown. Come on, Disney! I’ve seen Emma Watson look more like Belle in random magazine photo shoots than she did in this movie. 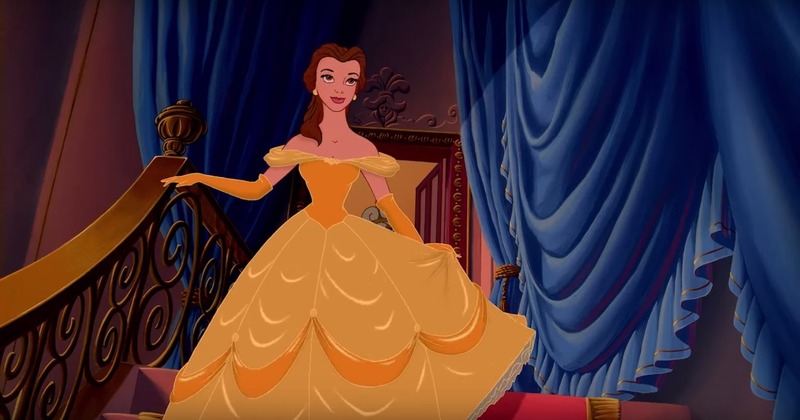 They could have at least applied a bit more makeup in the ballroom scene to make her look more Belle-like, or make the hairstyle more accurate to the animated, or at least more formal looking? It looked way too casual to me. They also added a necklace, which served absolutely no purpose other than to be yet another merchandising opportunity. The yellow dress was so poor-looking that the official merchandise version of the dress available for purchase looks THE SAME. Usually the merchandise version looks like a low-grade replica, but this one started that way so there was nowhere to go. Do I sound mad? Good, because I am mad. To make things worse, they gave Cinderella the elaborate, off the shoulder gown. LOOK AT THIS!!!! This is a travesty and I might never let it go. Don’t @ me. 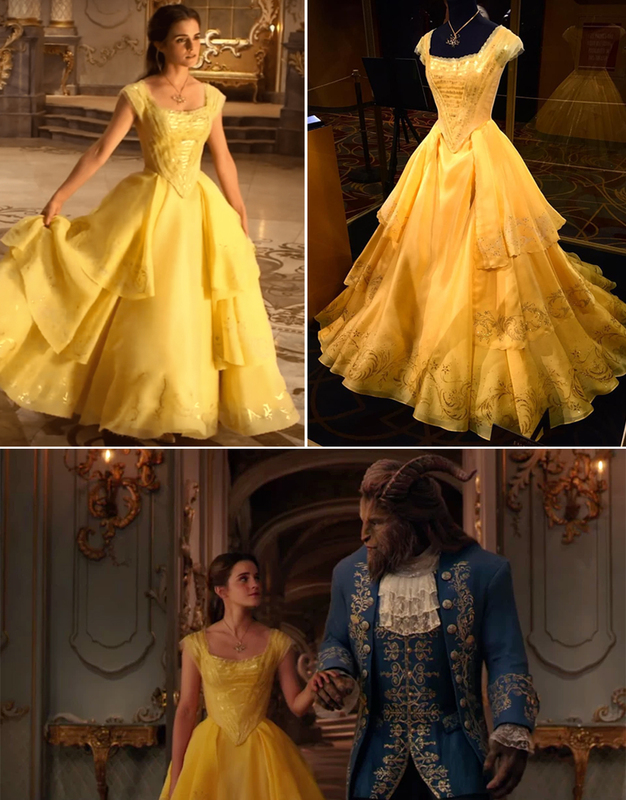 Somebody’s going to need to explain to me how in the HELL Cinderella’s live-action gown is more Belle-like than Belle’s gold (*cough*, yellow) gown in the live-action Beauty and the Beast remake. Like???? CINDERELLA got the off the shoulder dress??? Are you kidding me, Disney? And to rub salt into the wound further, they gave Cinderella a centre-parted, half down, half updo that is suspiciously Belle-like. 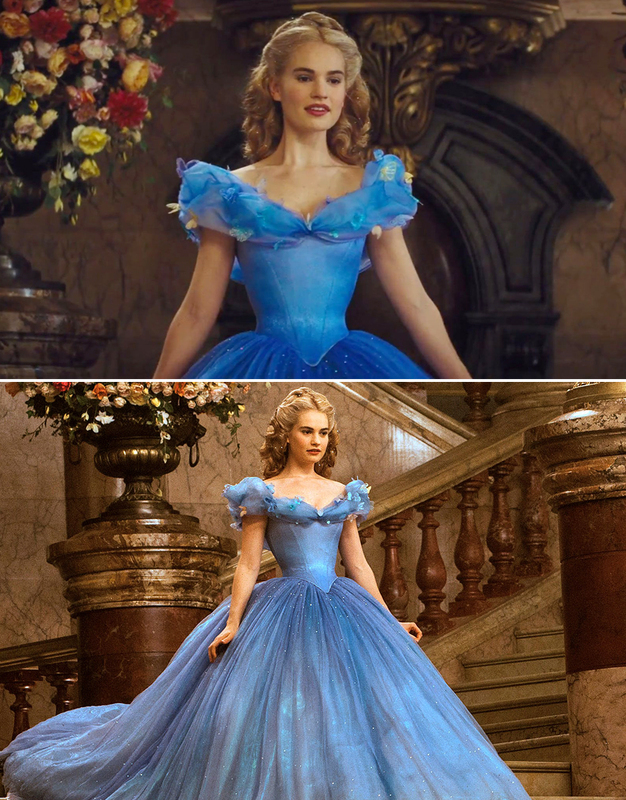 Lily James only needed to keep her natural brunette hair colour and dye the blue dress yellow, and we’d have a better result than the godforsaken, off-the-rack, tacky prom dress mess we got for Beauty and the Beast. I need to have words with Disney’s costume department, for real. The next time y’all are thinking about a live-action remake, call me. I’m available to consult. Do you agree? Disagree? Has this been bugging you for the past two years too? Am I alone in this? Let me know in the comments. Thanks for reading, and be safe out there tonight! Thank you so much for your sweet comment! People like you who notice the details I put into my costumes truly make my day. This one was really fun to do and I’m so glad I’m not the only one who was let down by the movie costume!